TURN USED GOODS INTO OPPORTUNITY EVEN AFTER YOU’VE USED IT. When opportunity knocks there are people ready to jump on the financial bandwagon to make quick money even if it means picking up stuff for free. It may be bad etiquette to re-sell free stuff but it happens and it will continue to happen because money is opportunity for anyone who has a financial mindset or a need to survive. 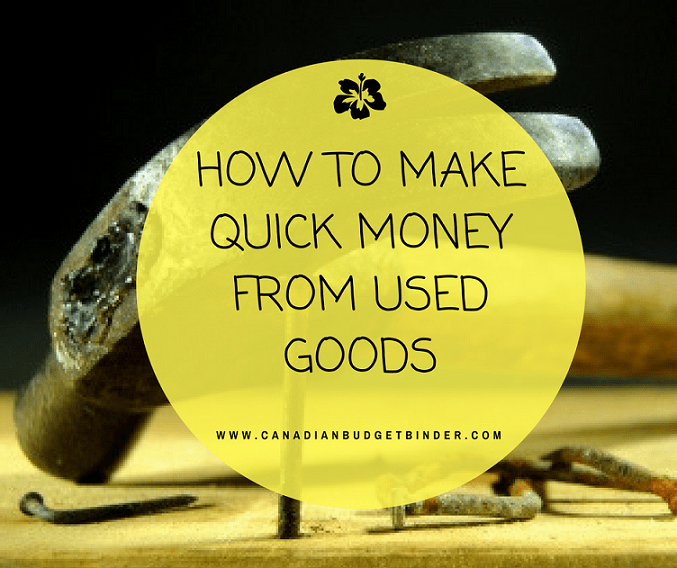 Your empty beer bottles, cans or anything that you would consider garbage or junk may be a gold mine to someone who is ready to turn dust into diamonds. Basically, if you’re not looking at everything you buy whether it be new or second-hand as a money-making opportunity someone else will. At least once a month or more if we can Mrs. CBB and I make a trip to the second-hand shops in town to see what new stuff is on the shelves. If you haven’t been it’s a money pot for anyone who is shopping for quick money purposes. The minute we walk through the doors of any second-hand shop we instantly have our money monitor turned on looking for the next opportunity. In a way it’s like a money game for us because we see which one of us can find something that we can make money from. We always do. It’s one of our money-making hobbies that we enjoy and don’t plan stopping any time soon. Whether we purchase something from a used shop or from Kijiji we never ever buy something that can’t be resold once we no longer want or need it. Even if the price is right don’t be a money fool, walk away. The person who buys something that can’t be resold or the likelihood of resale is slim is wasting their money. The best opportunity for a seller to sell their stuff is to be open to negotiations. I have never once posted an ad on Kijiji without thinking about price and negotiation room. Always leave a money gap so you have room to play around with negotiations. That means know what you want for an item and aim for a target area. As a buyer be cautious of the master negotiator that knows how to get what they want. You have to be better and find any loop holes that might set you above the next buyer. An example might be you being the first person to show up with cash to make a purchase. You may have negotiated a bit less but if the seller knows you’re on the way you can bet you’ll most often win the prize. Sellers wait for no one. Money is now not tomorrow, a week or when the next pay cheque comes in. Buyers don’t wait. Money talks. If you want to win at the game of earning quick money you have to learn how to negotiate. The more you practice the better you get. You need to learn how to read the buyer and the reasons behind what they are selling. Learn to engage in simple conversation as you might find out the reason they are selling their stuff. It’s not being cheeky either it’s called learning the art of conducting business.Some people give away too much information which causes buyers to have control of the money situation. It may seem like it’s taking advantage but it’s not if the seller is willing to sell something for any reasonable price or best offer. At the end of 2016 the Hatchimal craze drove money hungry consumers to the shelves to snap up all the eggs they could find. They were money smart because they know that if the supply was low and demand was high that they could easily make quick money especially since it was during the Christmas season when shoppers will pay just about anything for the right gift. Money fisherman/women are out there but you can’t even begin to stop or control them without set limits. Even then there is always a way to get more of what you want to make the quick money you know you can cash in on. Nothing will stop someone from driving store to store to buy as many of one product that they need. Nothing will stop someone from picking up free stuff and reselling it. Nothing. If it’s not your stuff it will be someone else’s. It’s hard to pass up money-making opportunities when it’s in your face. Truth. Today I want to explore the other side of opportunity and look at making quick money from buying used products. It’s a big industry especially for those people who know there is quick money to be made. Now that Spring is here Mrs. CBB and I have cleaned out the house of stuff we no longer use because it’s causing too much clutter in our lives. One of the best things we did for our money was to purchase almost everything we own second-hand but most of all with the resale mindset. Any time we sell something that we purchased used for more money or for the same money after using the item for the purpose needed is a big money win for us. An example would be a solid wood console table that we purchased for $20 from a garage sale that was in perfect condition. We know that solid wood is in demand and that $20 was a very low price for this gorgeous piece of furniture so we snapped it up. The table has sat in our hallway under a large mirror for years now and we’ve decided that we would like to move on and try something different in the space. Last week Mrs. CBB sold that console table to a woman for $75. We did nothing more than dust that table over the years and enjoy the beauty and functionality of it. This is one of the biggest deals when looking for items that you need in the present but likely will sell in the future. If the product is not for this purpose you still have to have this mindset in order to make quick money. Don’t buy a used item at the top of the price grid. You are risking not making your money back. If you can buy something for an awesome price and turn around and double your money it’s worth it. This is how the second-hand rollers earn quick money when they are spending money from their pockets. Getting free stuff and reselling is also popular. Not everyone wants to earn quick money so they give something away in hopes someone can use it or get it out of their hair. You know all the stuff you see on the curb for free, that homeowner doesn’t care what you do with it as long as you get it off their property. They are handing over the money-making power to the person who is willing to haul it away. That should be you. If you’ve ever seen the acronym ‘BNIB’ that means Brand New In Box or ‘BNWB’ meaning Brand New Without Box. Another common title to keep a look out for is ‘BNWT’ which is Brand New Without Tags. Learning the lingo is important if you want to get ahead of the game to earn some fast cash. This is your opportunity to jump in and negotiate low and then turn around and sell for higher. Always and I mean always make sure if you are buying a used item to inspect it to make sure the condition is impeccable. If your sole purpose is immediate resale you will need to negotiate based on condition and whether you can restore it to brand a new state again. The better something looks the odds of a sale are in your favour. Don’t buy something and expect that you will be the sole owner of the product. Why spend your money on something and throw it away? I know you can’t do this with everything but don’t let quick money slip between the cracks when it’s easy to make. You might find something that you know is rare whether it be toys or household items that will sell for more than what the price tag suggests. Knowledge is power not only for food prices at the grocery store but for everything that you spend your money on. Know what’s in demand by reviewing the ‘Wanted Ads’ online on the Buy and Sell websites and keep your ears and eyes open because you might just score a good deal that you can turn into quick money. Have you ever looked at something and thought about different ways you could use it? We do it all the time because it’s a great way to turn something boring into something unique. Home decor is a huge money-making business for the second-hand shopper with knowledge of what’s hot and in demand. If you can take something that you bought for cheap and turn it into a unique piece of furniture then you will find a buyer. We find bed frames turned into hallway benches and people scoop these pieces up because you can’t buy them in the stores. Custom work means unique and dollar signs if you know what you’re looking for. Buying solid wood pieces or even yarn at a low price can turn something into something big for your bank account. If you can knit buying excellent quality yarn for less because someone has extra or no longer knits is a steal. Find out what people want knitted and start a money-making hobby on the side. Someone we know buys solid wood furniture second-hand, sands it down and restores it to a brand new looking state with chic colors or stains. Add some fancy hardware and you’ve now got yourself a piece that someone is willing to buy. This friend of ours makes thousands of dollars every year from her little cash side-hustle. Whether you want to earn money on the side because it will help pay the bills or you do it as a hobby an reinvest the money it’s worth it if it makes you happy. The purpose of making money has to be fun and if you view it as a job then it won’t take you long to ditch the efforts involved. Explore your community and see what people are talking about, what’s in the news and how you can turn something you’ve bought second-hand into someone else’s luxury while growing your financial portfolio. Discussion Question: Have you ever purchased something second-hand for the sole purpose of re-sale value? What other tips can you provide to someone who wants to buy used and sell turn around to sell it after they use it? How I turned my passion and skills into extra money. We have been really tight on cash while I have been on maternity leave. So to earn a bit of extra money I have been selling off some of our kids clothes and toys once we no longer need them. I have been making pretty good money doing so, so I started shopping at thrift stores and reselling some of the kids items. This month I made $315 profit! What are some popular items that you find and resell from the thrift store? I tend to stick to children’s items (since it’s what I know). Anything brand name does well (melissa and doug, ravensburger, playmobil etc.). Wooden toys are popular too. But if I find it cheap I am willing to try it. I’ve also had a bit of luck with kids clothing, nursery decor, maternity items etc. We look for M &D as well. We have tonnes of kids clothes to sell. Do you have any tips for us? I see most people sell as a lot but we’ve struggled in the past to sell. Brilliant thanks Hayley… for the tips. 🙂 I’ll keep everyone updated as we purge and sell. You forgot another reason items are sold BNIB – they “fell” off the truck and are essentially stolen goods. That’s true thanks for mentioning it Sheila.